(Fortune Magazine) -- What makes Tiger Woods great? What made Berkshire Hathaway (Charts) Chairman Warren Buffett the world's premier investor? We think we know: Each was a natural who came into the world with a gift for doing exactly what he ended up doing. As Buffett told Fortune not long ago, he was "wired at birth to allocate capital." It's a one-in-a-million thing. You've got it - or you don't. Well, folks, it's not so simple. For one thing, you do not possess a natural gift for a certain job, because targeted natural gifts don't exist. (Sorry, Warren.) You are not a born CEO or investor or chess grandmaster. You will achieve greatness only through an enormous amount of hard work over many years. And not just any hard work, but work of a particular type that's demanding and painful. Born Winner? 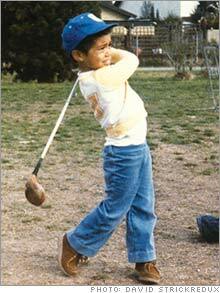 Golf champ Tiger Woods (pictured at 3 years old) never stopped trying to improve. Woods (pictured in 2001) devoted hours to practice and even remade his Swing twice, because that's what it took to get better. 1. Approach each critical task with an explicit goal of getting much better at it. 2. As you do the task, focus on what's happening and why you're doing it the way you are. 3. After the task, get feedback on your performance from multiple sources. Make changes in your behavior as necessary. 4. Continually build mental models of your situation - your industry, your company, your career. Enlarge the models to encompass more factors. 5. Do those steps regularly, not sporadically. Occasional practice does not work. 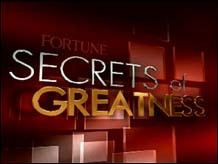 Wynton Marsalis, Google's Marissa Mayer and Craigslist's Jim Buckmaster reveal their personal strategies for success. Buffett, for instance, is famed for his discipline and the hours he spends studying financial statements of potential investment targets. The good news is that your lack of a natural gift is irrelevant - talent has little or nothing to do with greatness. You can make yourself into any number of things, and you can even make yourself great. Scientific experts are producing remarkably consistent findings across a wide array of fields. Understand that talent doesn't mean intelligence, motivation or personality traits. It's an innate ability to do some specific activity especially well. British-based researchers Michael J. Howe, Jane W. Davidson and John A. Sluboda conclude in an extensive study, "The evidence we have surveyed ... does not support the [notion that] excelling is a consequence of possessing innate gifts." The irresistible question - the "fundamental challenge" for researchers in this field, says the most prominent of them, professor K. Anders Ericsson of Florida State University - is, Why? How are certain people able to go on improving? The answers begin with consistent observations about great performers in many fields. Scientists worldwide have conducted scores of studies since the 1993 publication of a landmark paper by Ericsson and two colleagues, many focusing on sports, music and chess, in which performance is relatively easy to measure and plot over time. But plenty of additional studies have also examined other fields, including business. The first major conclusion is that nobody is great without work. It's nice to believe that if you find the field where you're naturally gifted, you'll be great from day one, but it doesn't happen. There's no evidence of high-level performance without experience or practice. Reinforcing that no-free-lunch finding is vast evidence that even the most accomplished people need around ten years of hard work before becoming world-class, a pattern so well established researchers call it the ten-year rule. What about Bobby Fischer, who became a chess grandmaster at 16? Turns out the rule holds: He'd had nine years of intensive study. And as John Horn of the University of Southern California and Hiromi Masunaga of California State University observe, "The ten-year rule represents a very rough estimate, and most researchers regard it as a minimum, not an average." In many fields (music, literature) elite performers need 20 or 30 years' experience before hitting their zenith. So greatness isn't handed to anyone; it requires a lot of hard work. Yet that isn't enough, since many people work hard for decades without approaching greatness or even getting significantly better. What's missing? The best people in any field are those who devote the most hours to what the researchers call "deliberate practice." It's activity that's explicitly intended to improve performance, that reaches for objectives just beyond one's level of competence, provides feedback on results and involves high levels of repetition. 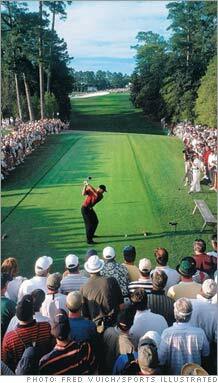 For example: Simply hitting a bucket of balls is not deliberate practice, which is why most golfers don't get better. Hitting an eight-iron 300 times with a goal of leaving the ball within 20 feet of the pin 80 percent of the time, continually observing results and making appropriate adjustments, and doing that for hours every day - that's deliberate practice. Consistency is crucial. As Ericsson notes, "Elite performers in many diverse domains have been found to practice, on the average, roughly the same amount every day, including weekends." Evidence crosses a remarkable range of fields. In a study of 20-year-old violinists by Ericsson and colleagues, the best group (judged by conservatory teachers) averaged 10,000 hours of deliberate practice over their lives; the next-best averaged 7,500 hours; and the next, 5,000. It's the same story in surgery, insurance sales, and virtually every sport. More deliberate practice equals better performance. Tons of it equals great performance. Not all researchers are totally onboard with the myth-of-talent hypothesis, though their objections go to its edges rather than its center. For one thing, there are the intangibles. Two athletes might work equally hard, but what explains the ability of New England Patriots quarterback Tom Brady to perform at a higher level in the last two minutes of a game? Researchers also note, for example, child prodigies who could speak, read or play music at an unusually early age. But on investigation those cases generally include highly involved parents. And many prodigies do not go on to greatness in their early field, while great performers include many who showed no special early aptitude. Certainly some important traits are partly inherited, such as physical size and particular measures of intelligence, but those influence what a person doesn't do more than what he does; a five-footer will never be an NFL lineman, and a seven-footer will never be an Olympic gymnast. Even those restrictions are less severe than you'd expect: Ericsson notes, "Some international chess masters have IQs in the 90s." The more research that's done, the more solid the deliberate-practice model becomes. All this scholarly research is simply evidence for what great performers have been showing us for years. To take a handful of examples: Winston Churchill, one of the 20th century's greatest orators, practiced his speeches compulsively. Vladimir Horowitz supposedly said, "If I don't practice for a day, I know it. If I don't practice for two days, my wife knows it. If I don't practice for three days, the world knows it." He was certainly a demon practicer, but the same quote has been attributed to world-class musicians like Ignace Paderewski and Luciano Pavarotti. In football, all-time-great receiver Jerry Rice - passed up by 15 teams because they considered him too slow - practiced so hard that other players would get sick trying to keep up. Tiger Woods is a textbook example of what the research shows. Because his father introduced him to golf at an extremely early age - 18 months - and encouraged him to practice intensively, Woods had racked up at least 15 years of practice by the time he became the youngest-ever winner of the U.S. Amateur Championship, at age 18. Also in line with the findings, he has never stopped trying to improve, devoting many hours a day to conditioning and practice, even remaking his swing twice because that's what it took to get even better. The evidence, scientific as well as anecdotal, seems overwhelmingly in favor of deliberate practice as the source of great performance. Just one problem: How do you practice business? Many elements of business, in fact, are directly practicable. Presenting, negotiating, delivering evaluations, deciphering financial statements - you can practice them all. Still, they aren't the essence of great managerial performance. That requires making judgments and decisions with imperfect information in an uncertain environment, interacting with people, seeking information - can you practice those things too? You can, though not in the way you would practice a Chopin etude. Instead, it's all about how you do what you're already doing - you create the practice in your work, which requires a few critical changes. The first is going at any task with a new goal: Instead of merely trying to get it done, you aim to get better at it. Report writing involves finding information, analyzing it and presenting it - each an improvable skill. Chairing a board meeting requires understanding the company's strategy in the deepest way, forming a coherent view of coming market changes and setting a tone for the discussion. Anything that anyone does at work, from the most basic task to the most exalted, is an improvable skill. Armed with that mindset, people go at a job in a new way. Research shows they process information more deeply and retain it longer. They want more information on what they're doing and seek other perspectives. They adopt a longer-term point of view. In the activity itself, the mindset persists. You aren't just doing the job, you're explicitly trying to get better at it in the larger sense. Again, research shows that this difference in mental approach is vital. For example, when amateur singers take a singing lesson, they experience it as fun, a release of tension. But for professional singers, it's the opposite: They increase their concentration and focus on improving their performance during the lesson. Same activity, different mindset. Feedback is crucial, and getting it should be no problem in business. Yet most people don't seek it; they just wait for it, half hoping it won't come. Without it, as Goldman Sachs leadership-development chief Steve Kerr says, "it's as if you're bowling through a curtain that comes down to knee level. If you don't know how successful you are, two things happen: One, you don't get any better, and two, you stop caring." In some companies, like General Electric, frequent feedback is part of the culture. If you aren't lucky enough to get that, seek it out. Through the whole process, one of your goals is to build what the researchers call "mental models of your business" - pictures of how the elements fit together and influence one another. The more you work on it, the larger your mental models will become and the better your performance will grow. Andy Grove could keep a model of a whole world-changing technology industry in his head and adapt Intel (Charts) as needed. Bill Gates, Microsoft's (Charts) founder, had the same knack: He could see at the dawn of the PC that his goal of a computer on every desk was realistic and would create an unimaginably large market. John D. Rockefeller, too, saw ahead when the world-changing new industry was oil. Napoleon was perhaps the greatest ever. He could not only hold all the elements of a vast battle in his mind but, more important, could also respond quickly when they shifted in unexpected ways. That's a lot to focus on for the benefits of deliberate practice - and worthless without one more requirement: Do it regularly, not sporadically. For most people, work is hard enough without pushing even harder. Those extra steps are so difficult and painful they almost never get done. That's the way it must be. If great performance were easy, it wouldn't be rare. Which leads to possibly the deepest question about greatness. While experts understand an enormous amount about the behavior that produces great performance, they understand very little about where that behavior comes from. The authors of one study conclude, "We still do not know which factors encourage individuals to engage in deliberate practice." Or as University of Michigan business school professor Noel Tichy puts it after 30 years of working with managers, "Some people are much more motivated than others, and that's the existential question I cannot answer - why." The critical reality is that we are not hostage to some naturally granted level of talent. We can make ourselves what we will. Strangely, that idea is not popular. People hate abandoning the notion that they would coast to fame and riches if they found their talent. But that view is tragically constraining, because when they hit life's inevitable bumps in the road, they conclude that they just aren't gifted and give up. Maybe we can't expect most people to achieve greatness. It's just too demanding. But the striking, liberating news is that greatness isn't reserved for a preordained few. It is available to you and to everyone. How one CEO learned to fly. Boeing chief James McNerney has now made his mark at three major companies. How? "Help others get better," he says.